I started working on this quite some time ago but I was sidetracked by the complexities of evading in Art de la Guerre (ADLG). 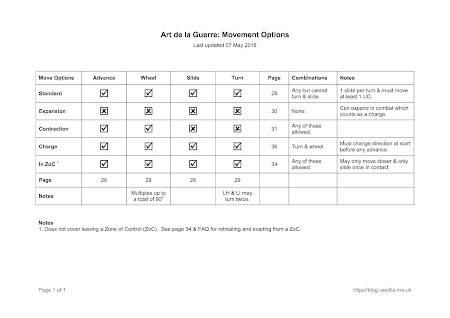 Originally, I wanted to add the evade move to the table but it's far too complex and would break the format. I wanted this written down because during some games, and for some inexplicable reason, I have repeatedly tried to move and expand a group. I suppose old age comes to us all. To me the table serves a useful purpose: it lays bare the "sub-moves" that can be combined with a simple advance during the various movement options. It also highlights an important timing issue with charges. As I've come to expect, ADLG exhibits an underlying complexity even in something as basic as movement. 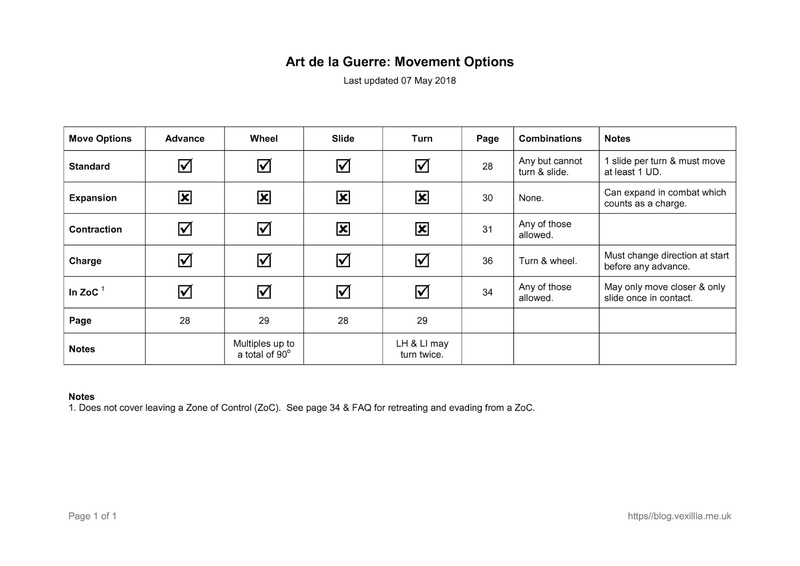 I don't think movement in ADLG is that much more complex than other rules I have used but I do think it is more complex than it first appears (even before you consider the evade rules). What's worrying me is that I nearly always find parts of ADLG more complex that they first appear! As always use at your own risk and if you spot any mistakes, or you know of anything I've missed, please leave a comment and I'll update the table & the post. Update: "In ZOC" line does not cover exiting a ZOC. Update: Standard move combinations edited to "Any but cannot turn & slide".